We need to convert a Diamond Jet gun ‘air cooled’ hardware from Propylene to Propane. I know it’s not the greatest fuel but it must be done. The manual doesn’t have any parameters or spray tables for ‘air-cooled’ Propane spraying. I have Propane parameters but they list the DJ3-9 air cap or ‘DJ1050 HARDWARE’ configuration. 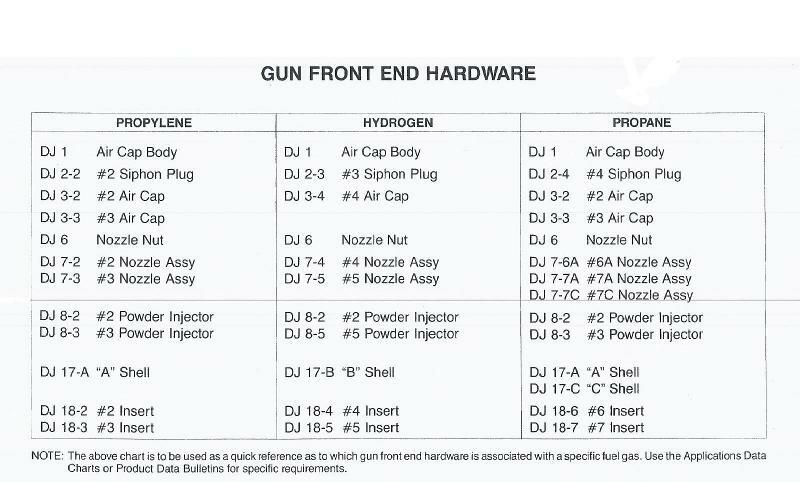 Maybe these “DJ3-9 air cap or ‘DJ1050 HARDWARE’ configurations” superseded the old (in table above)? Is the attached any use to you Len ? No, But but thanks anyway.